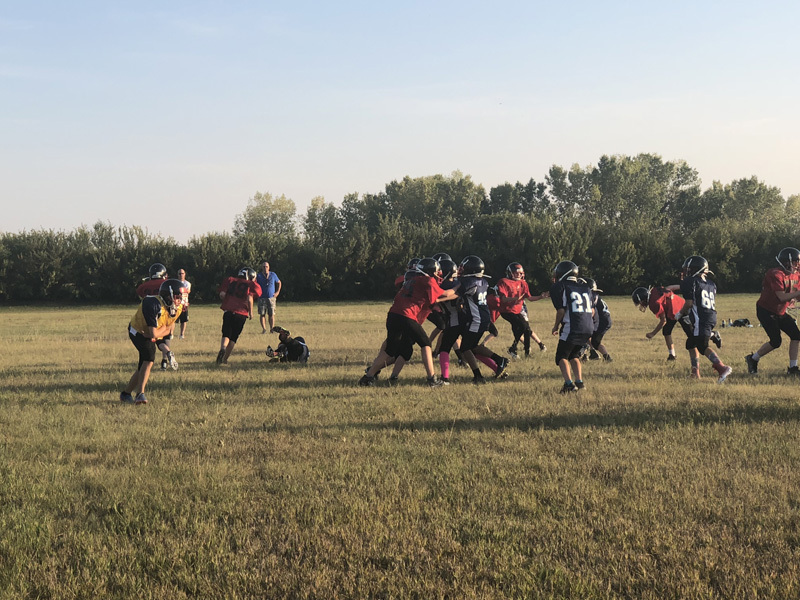 As the football season gets underway for the PeeWee Chestermere Chiefs, Head Coach Theo Price’s goals for the season stretch well beyond the field of play. For Price, he wants to guide his players into being successful well-rounded people, not just football players. “There’s lots of football players out there but it’s trying to build little humans that can go on to succeed in life,” said Price. “I want these kids to go to college, we want them to go to high school you want them to go do all their dreams and realize that if you work hard you can accomplish all these feats by just working hard and working for another person going for one goal,” he said. And for Price, football is the ideal team sport to help these kids develop the skills they’ll need in life. “It takes 12 people on a field doing something in synchronization to perfection to get even 5 let alone ten yards let alone a touch down so it teaches these kids accountability, it teaches them to look out for one another,” he said. The coaching staff’s goal is to teach the kids not to just work as a team on the field but to take those skills off the field and into their day to day lives. “We want these kids to grow up in the community of Chestermere to be leaders in this community,” he said. If these goals are met, Price said he doesn’t actually care about how many games they win or touchdowns they score. That being said, Price does want to go out and compete in every game. And the Chiefs will have their work cut out for them this year, with their numbers down a bit from past years they are going up against Calgary teams that cut more kids than the Chiefs have on their roster. This year they have just over 30 kids on the team. “The quantity might be down but the quality is really, really high,” said Price of his team. “There’s some good football players, there’s some really good athletes,” he said. Adding to their roster woes is the fact that once hockey season starts up, they often see game day absences from players competing in both sports. “It’s a big hockey town,” said Price. “Once September rolls around we can lose anywhere between five to 10 kids on a given game day,” he said. With the knowledge that he’ll lose the occasional player to hockey, Price said he’d prefer to have about 36 players on the team. While the loses to his roster can provide a challenge, Price is happy to see the kids playing as many sports as they can. “As many sports as these kids can play the better,” he said.